Bring back the asylum: A critical analysis of the call for a "return to 'modern' institutionalization methods"
Cassandra Evans is a Ph.D. student in Disability Studies at Stony Brook University. 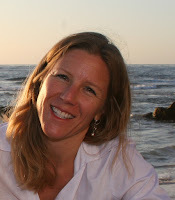 She studies mental disabilities and ethics surrounding treatment, services, and access for individuals with mental disabilities. She is currently examining the history of institutions in Suffolk County, Long Island (New York) and what shape the “way forward” from institutionalization will take in the new millennium. 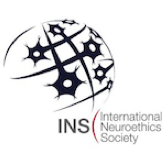 This post is a shorter version of a talk Cassandra gave at the Society for Disability Studies’ national conference in Atlanta, Georgia, June 11, 2015.
severe disabilities or who were more geriatric ended up here. 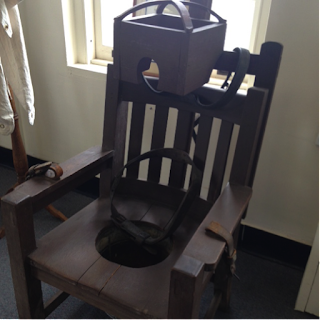 It was a recent ethical argument on this topic in the Journal of American Medical Association (JAMA) that prompted me to visit the Long Island Psychiatric Museum. This article, “Improving long-term psychiatric care: bring back the asylum,” by Sisti, Segal and Emanuel (2015) made major waves in both academic and lay literature. In it, the authors argue that because of “transinstitutionalization”—the failure of deinstitutionalization to guarantee appropriate placements for former residents of these homes—the “way forward” for severe psychiatric patients is a return back to the asylum (Sisti et al, 2015). brick wards built on Pilgrim’s campus. While I am not categorically opposed to in-patient treatment for many health needs, and I do agree that the streets, emergency rooms, and jails or prisons are not safe nor appropriate places for people with mental disabilities, I argue that prudence and caution must guide newer service delivery decisions as well as humane and person-centered care. We must also remember that some individuals do in fact choose to be homeless and are quite happy doing so. Asylums, prisons, and streets are not the only answers—community-based mental health services have yet to be fully actualized. And, if, in some cases, a long-term institution is necessary, I wonder, how do we guarantee its benevolence and efficacy? The consumer/survivor/ex-patient/mad or “c/s/x/m community,” as its often described today, and their families deserve an answer to this question. We must also consider the possibility for non-medical motives for institutionalization. 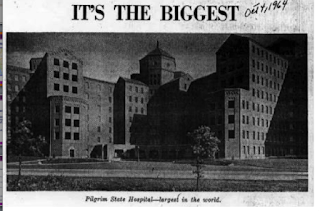 Some have argued large asylums were not only part of the medical system, but were also integral parts of local economies. While Pilgrim’s claim to being the “largest in the world” was true—no institution was physically larger nor housed more patients than Pilgrim—it was also grand in terms of job creation. As Liat Ben-Moshe argues, housing bodies in institutions like these historically (and in present day) created thousands of jobs (2011). Citing Russell’s logic of “handicapitalism,” Ben-Moshe calls our attention to the risks of making the “unproductive” or non-working bodies lucrative when we place them in institutional beds—whether that means jails, nursing homes, psychiatric centers or group homes. 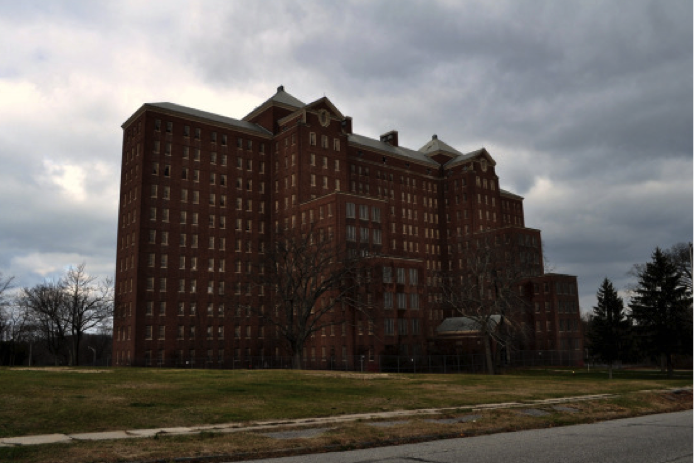 The four large institutions built in the late 19th century to mid 20th century in Long Island, in fact, brought the region thousands of jobs, fostered an entire economy based on psychiatric “care,” and created what are now the numerous towns in the area. As institutions in cities like New York became overcrowded, states looked to rural areas to create “work farms” or silos to warehouse patients. Thus, an entire industry was designed, built, and sustained around mental disabilities for decades. who live on campus long-term. As I looked at black and white photos of men in straightjackets, I also thought of the “O and O” or “R and R” that James Trent writes about in Inventing the Feeble Mind (1994). These “work farms” were supposed to promote “Oxygen and Occupation” or “Rest and Relaxation.” The proposed philosophy behind institutionalization of both mental patients and “the feeble minded” through the end of the 19th and early 20th centuries touted outdoor experiences, fresh air, and acres of open land. The design of these rural farms (all over the country) would allow for shipping family members with serious mental disabilities off to safer, more controlled environments in picturesque areas where they could be a part of pastoral life—planting and tending crops, milking cows, sewing, and cooking country meals. While some of these activities did become part of some patients’ days, we now know, in the case of the individuals in psychiatric hospitals, they were still subjected to prolonged and significant physical restraints, experimental lobotomy surgeries, shock treatments, hydrotherapy, insulin, isolation, and testing of Thorazine. In addition, as Trent notes, “the feeble-minded” were commonly sterilized at their “work farms” (1994). United States—Ohio, Pennsylvania and New York were featured. in the 1938 LIFE Magazine expose on “state-of-the-art” treatments. I looked at the expansive grounds surrounding this particular parcel of land (at its height 1000 acres), and wondered how many of its 10,000 to 16,000 residents (the largest number of patients varies depending on the source) were actually participating in the “O & O” or “R & R” the institutions touted and for which the state or their families paid. Sisti, Segal and Emanuel describe the asylum as a place of “retreat and security; shelter” (2015). 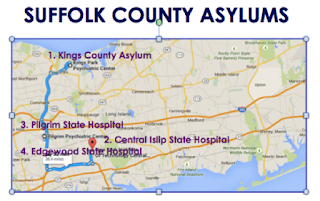 They point to Worcester Recovery Center and Hospital in Massachusetts as a new, model asylum. It has electronic health records, 320 private rooms for “patients with chronic, serious mental illness,” and a fully integrated health system as a possible model for reform (244). They note that centers like this one are more desirable than the default treatment centers of nursing homes, jails, and prisons. 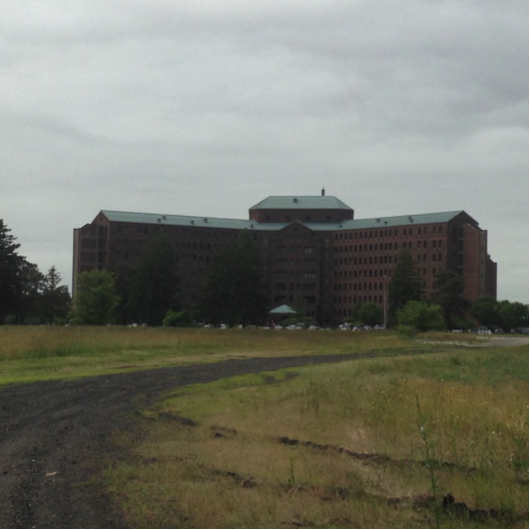 Coincidentally, Pilgrim Psychiatric Center, the last remaining institution of the four original asylums in Suffolk County, houses only about 300 long-term psychiatric patients now—about the same number for which Worcester was built. Pilgrim’s registry shrunk from a capacity of between 11,000 and 16,000 to a mere 300. The hospital says there are no longer direct admits and its goal is to only have patients stay for a maximum of six months of treatment, then discharge. However, currently, because there are still residual residents who have spent their entire lives in institutions, “the official average is eight years and one-third months” (Kalvin, 2015). Of course there are far more than 300 people in Suffolk County, Long Island that need long-term care. While I agree, YES (emphatically), neither streets nor jail are proper places for long-term care (in some cases, it could be argued that those spaces may actually make recovery or community re-integration less likely when prison staff are not properly trained or equipped to be mental health providers), we must interrogate what it means for an asylum-like hospital to be a “safe haven,” or a “refuge.” The question of how long “long-term” is bears pondering as well. In order to be truly “patient-centered,” perhaps there is a way forward that includes the c/s/x/m community in designing these havens, asking these questions and providing answers. Additionally, when Sisti, et al dismiss community-based mental health services as failures while admitting they were never well-funded, they leave more stones unturned. Further inquiry is needed to answer how community-based mental health services can become more effective and well-funded. Do parents and professionals still prefer asylums because they are more convenient and cost-effective? And, finally, it is worth noting that some individuals will continue to choose the streets as alternatives to asylums, prisons, or community care centers. In the end, there were no self-identified c/s/x/m on my tour of the asylum—only two nurses who had lived on the Pilgrim campus attending nursing school and a couple who was taking the tour with their baby as “urban adventurers.” The nurses were celebrating their 40th anniversary of graduating from nursing school and the urban adventurer couple was trying to visit as many asylums across the country as they could. The baby was could not tell me why he was there, but he was screaming loudly, restrained in his chair, crying, and acting like he wanted to get out. Ben-Moshe, L. (2011). Disabling incarceration: connecting disability to divergent confinement in the USA. Critical Sociology doi: 10.1177/0896920511430864. Foucault, M. (1965). Madness and civilization: a history of insanity in the age of reason. New York: Random House. Foucault, M. (1977). Discipline and Punish: The Birth of the Prison. Translated by Alan Sheridan, London: Allen Lane, Penguin. First published in French as Surveiller et punir, Gallimard, Paris, 1975. Goffman, E. (1961). 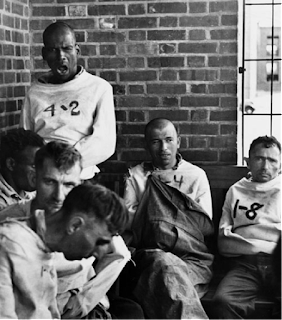 Asylums; essays on the social situation of mental patients and other inmates. Garden City, N.Y.: Anchor Books. Kalvin, S. (2015, June 3). Volunteer museum tour operator and employee of Pilgrim Psychiatric Center. In person interview at Long Island Psychiatric Museum. Kings Park: stories from an American mental institution [Motion picture]. (2011) Wildlight Productions (Lucy Winer). Merriam-Webster Dictionary (2015, June 2). Retrieved from http://www.merriam-webster.com/dictionary/asylum. Montross, C. (2015, February 18). The Modern Asylum. The New York Times. Retrieved from http://www.nytimes.com/2015/02/18/opinion/the-modern-asylum.html?_r=0. Russell, M. (1998). Beyond ramps: disability at the end of he social contract—a warning from an uppity crip. Monroe, ME: Common Courage Press. Sisti, D.A., Segal, A.G., Emanuel, E. J. (2015). 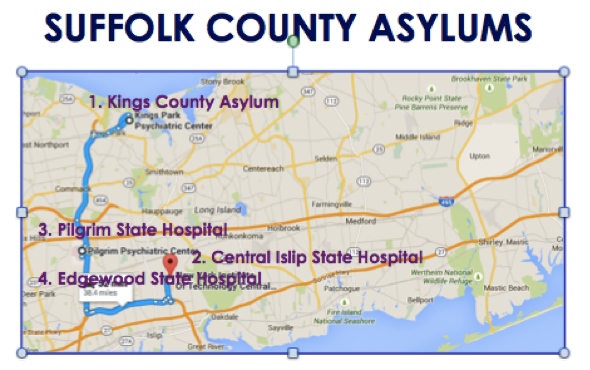 Improving long-term psychiatric care: bring back the asylum. Journal of American Medical Association, 313(3): 243-244. Trent, J. (1994). Inventing the feeble mind: a history of mental retardation in the United States. Berkeley: University of California Press. Thanks for this. I'd read the Tweets during SDS, but this gives me a much clearer sense of your presentation Cassandra.